There is more to Vietnamese cuisine than just pho (pronounced ‘fur’), the ubiquitous flat rice noodles with sliced beef and fresh herbs. 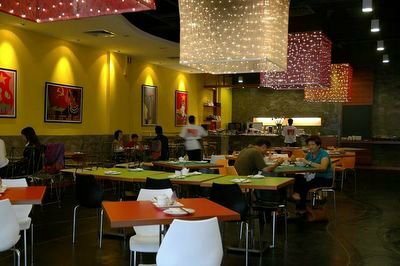 And the new Sao Nam outlet at Hartamas Shopping Centre is out to prove it with their repertoire of refined Central Vietnamese specialities with a selection of Hanoi's most popular specialities. 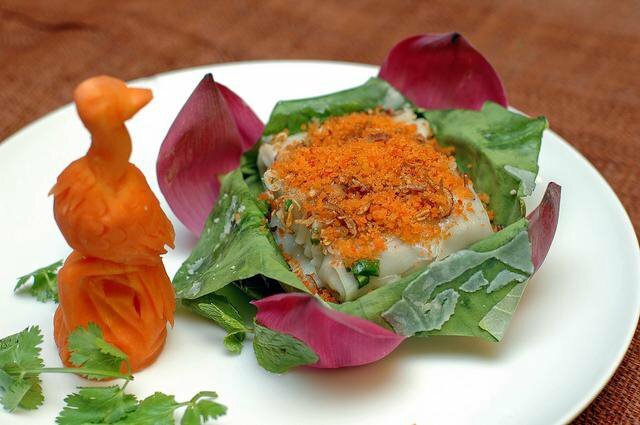 Did you know that Hue cuisine is regarded as the best? At the height of its halcyon days during Emperor Tu Duc’s reign (1848 – 1883), many imperial delicacies were meticulously prepared and aesthetically presented in Hue to please the artistically inclined royal. Needless to say culinary artistry were at its peak then. In the neighbouring city of Hoi An, however, dumplings and noodles were the rage thanks to the influence and presence of Chinese traders who came in the 1700s. Chef Tran Luong, who has invaluable working experience with renowned restaurants back in Hoi An such as the Mandarin and Emperor, is entrusted with churning out the various house delicacies. Noteworthy starters include the traditional Cha Gio Re (RM16++ for 6 pcs), prawn and chicken spring rolls with home-made wraps, Banh Cuon Hap La Sen (RM22++, 6 pcs), steamed rice rolls with chicken and shrimp mince on lotus leaf and Banh Cuon Tom Ap Chao (RM22++, 6 pcs), fried home-made rice cakes with shrimp mince. The spring rolls were outstanding for their crispy yet thin, lacey wrapping. Painstakingly made on premise by Chef Tran Luong, the filigree web-like skins bore testimony to the chef’s deft expertise and the hallmark of fine Hue cuisine. Both the Banh Cuon Hap La Sen and Banh Cuon Tom Ap Chaou bore their nmistakably Chinese influence. The first starter is akin to chee cheong fun (flat rice noodle rolls) but shorter in length and less greasy. 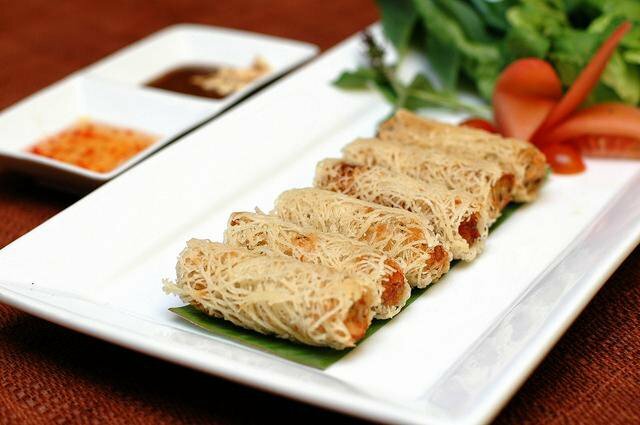 Filled with a minced chicken filling and a topping of orange-hued shrimp floss and crispy deep-fried sliced shallots, the rolls are imbued with the delicate scent of its lotus leaf wrapping. Try them with the accompanying sweet bean and peanut dip or fish sauce with minced garlic and chopped chilli for different taste sensations. Equally memorable is the fried homemade rice cakes with shrimp mince comprises pan-fried squares of thin rice flour wraps enveloping some shrimp mince. Salads also feature prominently in Vietnamese cuisine with Goi Hoa Chuoi Ga (RM22++) or young banana flower and grilled chicken salad from Hanoi topping the list. We like its invigorating taste and varying textures. For main dishes, we recommend Bahn Khoai (RM16++), Ga Nuong La Chanh (RM18++) and Vit Nuong Sot Cam (RM32++). Bahn Khoai is a typical Hue specialty of fried open-face pancake with chicken, prawn, fish mousse and bean sprouts. Cut into wedges, this delectable pancake with its various toppings can be enjoyed, wrapped in either fresh lettuce leaves or rice paper lined with a sprig of mint and basil. It is a scrumptious mixture of flavours with crunchy beansprouts and fresh herbs nicely balancing the richer toppings. Another dish that will find ready acceptance amongst locals is Ga Nuong La Chanh, grilled chicken with kaffir lime leaves. The boneless chicken is succulent and flavourful, with the fine shredded kaffir lime leaves lending it a mouth-watering aroma. Vietnam’s French colonial heritage comes to the fore in Vit Nuong Sot Cam or crispy duck with orange sauce. Similar to the famed specialty of duck à l’orange, the tender slices of duck breast with a thin layer of fat underneath its skin are aptly complemented by a mild, sweet citrusy sauce that counteracts the meat’s richness. The Bun Bo Hue (RM14++) is the Hue version of beef noodles in soup. Slightly different from Hanoi’s popular pho bo (beef noodles), this broth is darker, more intense and full-bodied. 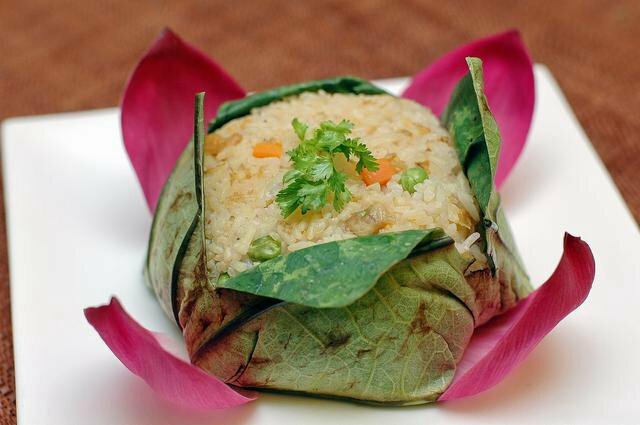 The Com Hap La Sen (RM18++) is the Vietnamese take on Chinese hor yip fan (steamed rice in lotus leaf). Redolent with the subtle fragrance of its lotus leaf wrapping and studded with diced chicken, dried shrimp and lotus seeds, this rice dish will probably go down well with less adventurous diners. Round off your meal with desserts such as Che Khoai Mon (yam and sago in coconut milk, RM8++), Chuoi Chien Cot Dua (banana fritters with coconut milk sauce, RM8++), Che Long Nghan (longans stuffed with lotus seed syrup, RM8++) or Banh Flan Bi (caramel custard in pumpkin, RM16++). Otherwise a glass of Vietnamese drip coffee is just as good. The outlet adopts a modern, minimalist approach to its décor, incorporating fabric lanterns and large colourful graphic posters. Service is informal but fast. The dishes may seem a little pricey but like its pioneer sister outlet in KL, the new Sao Nam is steadfast in upholding its food quality and taste authenticity. Despite hearing so much good things about Tamarind Springs from friends and acquaintances, the inclination just wasn't there for me to seek out this destination restaurant. As we hurtle towards Ampang/Ulu Klang on the elevated highway, I really have no idea what to expect. Of course the dark storm clouds gathering on the horizon didn't help alleviate my apprehensions. It was almost twilight when we located Tamarind Springs. Its wooden gated doorway reminded me of a luxury resort entrance - as we stepped over the threshold, it was as if we had entered into a completely different dimension. Surrounded by lush garden greenery and a descending white pebble walkway set with wooden steps and flanked by twinkling tealights on both sides, it was indeed a sight to behold. Romantic, dramatic and mysterious were what came to mind immediately. As we made our way to the restaurant proper, we passed a large pond filled with water lilies and a tinkling fountain. Above us the trees are aglow from the cocoon-like lanterns suspended in midair. Staff dressed in traditional Indo-Chinese attire welcomed and ushered us to a semi al fresco verandah, overlooking the verdant jungle nearby. Tamarind Springs was aptly named after the waterway that winds through the restaurant's property. 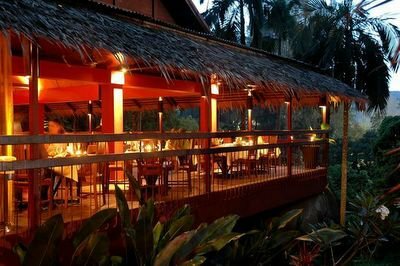 While its sister outlet Tamarind Hill specialises in Thai cuisine, Tamarind Springs serves modern, refined interpretations of Indo-Chinese cuisine by Executive Chef Somkhuan Wandee. This Chiang Mai native who acquired her culinary skills from her mother, is greatly inspired by her grandmother who once had the honour of serving the King Of Siam. The Indo-Chinese menu comprises a repertoire of Laotian, Vietnamese and Cambodian cuisines. Laotian food share many similarities with Thai cuisine for its robustness and liberal use of spices while Cambodian food is influenced by Chinese and Vietnamese cuisines. As one of the participanting outlets in the Kuala Lumpur International Gourmet Festival that will be held from November 10 to December 8, 2005, Tamarind Springs has planned a special Festival Menu priced at RM280++ for 2 persons. But do check out their a la carte menu too which is just as exotic and exquisite. 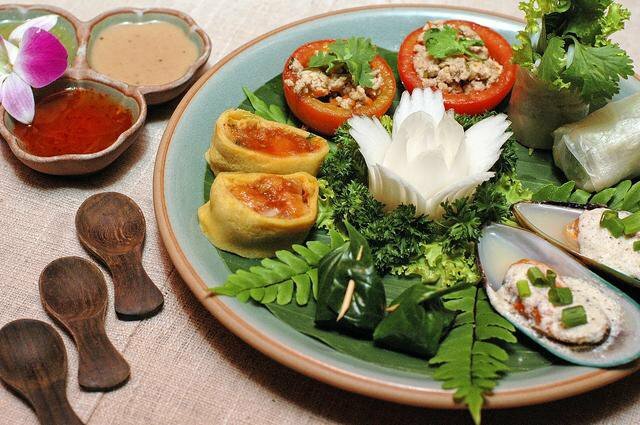 The visual and palate-pleasing Tamarind Springs Platter comprising hor d’oeuvres of omelette rolls, meang kam, steamed mussels dressed and tomato stuffed with minced chicken. Each of these appetizers teases the tastebuds with their varied nuances but the miniature meang kam parcels of crushed peanuts, finely diced shallots and ginger, dry-fried coconut, diced fresh lime and dried shrimp wrapped in betel leaves are particularly outstanding. 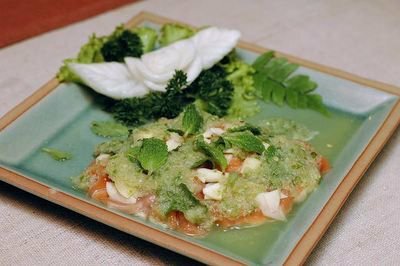 Another appetiser of Salmon Sashimi and Water Chestnut with a distinctive Laotian house dressing is equally memorable for its concoction of briny fish sauce, fresh lime juice, grated ginger and bird’s eye chillies giving added zing to the succulent raw salmon. Tempered by the gentle sweetness of sliced water chestnuts, this sublime salad is given a refreshing lift with sprigs of fresh mint. 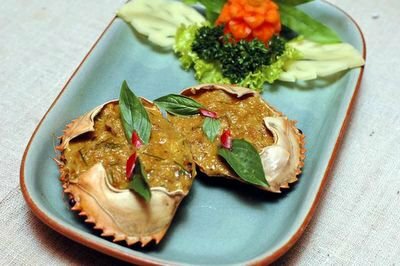 For main course, the Khmer Sea Crabs and Banana Blossom Curry is a rich, creamy and subtly spicy curry mixed with minced crabmeat and chopped banana blossom. This delectable creation came served in two crab shells accompanied by yellow glutinous rice. The Barbequed Beef Rolls in Sugarcane exemplifies the rusticity of IndoChinese cuisine perfectly. With a sprinkling of cracked pepper and the sugarcane’s inherent sweetness clinging coyly to the grilled thin beef slices, this simple, homely dish tastes utterly divine. Even the Broccoli and Tofu (beancurd) in Spicy Almond Sauce exudes its unique Indo-Chinese trait with the inimitable fish sauce making its presence felt in the light, spicy sauce which tops this combo of diced beancurd, broccoli florets, fried cashew nuts and shallots. Saigon Buo Loy or glutinous balls in ginger syrup concludes this menu on a high note. 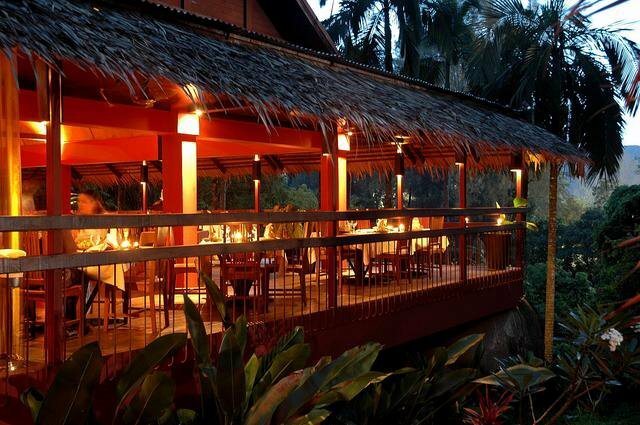 Tamarind Springs is definitely one destination restaurant that we reckon will be worthy of your time and money. Dinner is definitely more popular due to the outlet’s ethereal and romantic ambience, so prior reservations are advisable. Business hours –12 noon to 3 pm for lunch; 6 pm to 10.30 pm for dinner. Closed on Mondays.